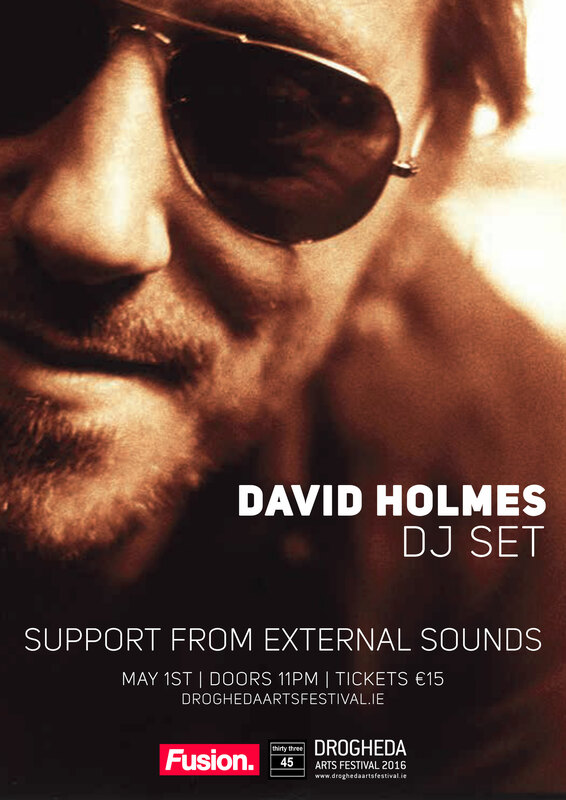 ‘thirty three – 45’ is delighted to partner once again with the Drogheda arts Festival 2016 to bring another Drogheda-only exclusive to the festival – a live DJ Set by the renowned DJ & producer David Holmes. In Belfast-born Holmes’ varied professional life, he has produced five of his own albums, and worked with Primal Scream, Noel Gallagher and Manic St Preachers. David has worked on over 20 film soundtracks including the Oceans 11, 12 and 13, Hunger starring Michael Fassbender, Haywire, and Good Vibrations. Last year David Holmes won an Ivor Novello for his score for the film 71. More recently he has scored the music to well received BBC dramas The Fall and London Spy. David Holmes’ new project Unloved, a collaboration with Keefus Ciancia and Jade Vincent, released their debut album in March. With special guests External Sounds.